This year is moving along and we are about half way through the summer now. The average price for single-family homes sold in Greater Victoria last month was $615,000 down from $649,280 in June. The six-month avereage declined slightly to $632,280. There were 16 sales of over $1 million including one on the Gulf Islands. Below is a quote from the Victoria Real Estate Board News Release dated August 3, 2010 which I hope you find interesting. Greater Victoria consists of many areas for example Downtown Victoria, James Bay, Fairfield, Fernwood, Rockland (this is where the Government House is located), Central Park and Vic West is just over the 'Blue Bridge' next to Esquimalt which isn't part of the Greater Victoria area. 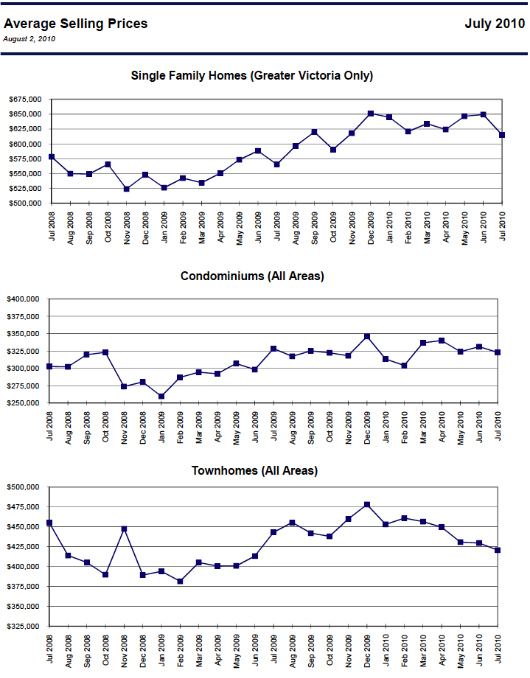 This graph shows you the difference in Single Family Homes, Condominiums and Townhomes from July 2008 to July 2010. Below is a graph for Single Family Homes, showing the number of reported sales by price range for the month of July. For example there were 40 sales for the month of July and 299 Year-to-date. Majority of sales were under the $600,000. price range. 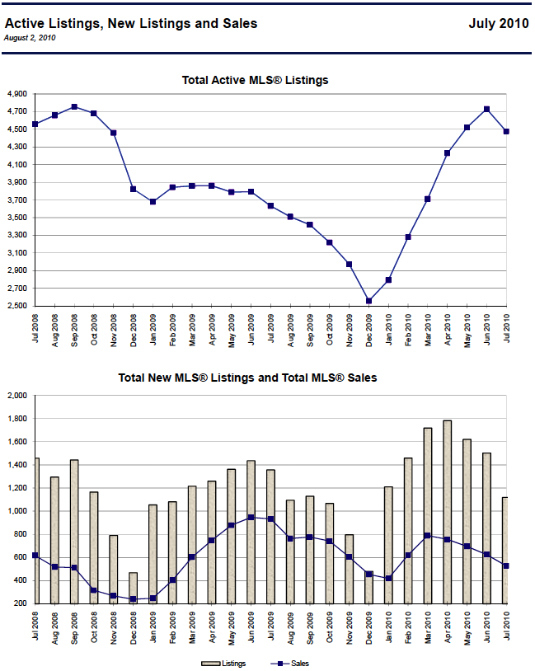 The top graph shows the total Active MLS® Listings and the bottom graph explains the total NEW MLS® Listings and total MLS® sales for the month of July. The real estate market still is showing that there is a lot of inventory to choose from for Buyers. I have noticed in the past week the activity is picking up compared to this time last month. If you weren't in town and missed the Victoria Symphony Splash that was held on BC Day in Victoria's Inner Harbour, don't worry it is an annual event and you can plan for next year's event! I hope this has helped you understand the current market in Victoria BC as we head into August. Please read my blog if you are looking for more information about the Oak Bay area and that particular real estate market. If you are thinking about Selling or Buying residential real estate please call me direct at 250.744.4556, 1.800.550.0585 or follow me on twitter at http://twitter.com/brussell6. Experienced, licenced for 20 years and dedicated to service with a smile. Please stay tuned for more updates.